Internet gambling has become one of the biggest industries in the world. The United State has a vast complex market of companies competing to gain customers and have the best win opportunities available. This page is designed to give you the information you need to know about the laws that govern these sites and how these laws affect your ability to play. The information on this site is for informational purposes only. We're not lawyers and don't claim to be experts in gambling laws. We're giving you an overview of the federal and state laws that apply to online gambling so you can be informed before you step into the world of online gambling. The United States is famous for enacting laws for just about every single industry and having these laws redacted, changed, and renewed several times over the years. It's important that you know the most up to date information if you want to be a member of the ever growing world of online gambling. The federal government isn't the only governing body that's able to make laws in regards to the online gambling industry. Each state has its own laws that allow, prohibit, or restrict gambling on land and online. Before you try to start gambling online you need to make sure its legal to do so within the state you live. The laws in each state differ and can at times be confusing, as can those from the federal government. Most of these laws are written by people who know little to nothing about the industry which can cause problems with the enforcement of the laws. The laws tend to be vague and leave too much room for interpretation which can give judges and prosecutors the ability to go on crusades based on their feelings on the subject. As you go through this page you can familiarize yourself with a generous overview of both state and federal laws. The overview includes possible consequences of breaking these laws and where online gambling is allowed and with what restriction. We hope this page gives you all the information you need to successfully navigate the online gambling industry. From the first emergence of online gambling those in the federal government thought it necessary to enact laws that any company, whether land based or digital, must follow. Some of the laws that affect the online industry were enacted before the emergence of the online world, but these new gambling forms still have to follow these laws. Below we're going to give you an overview of the laws that apply to the online gaming industry. The first thing you may notice is the date on this law. Yes, it was passed into law in 1961, which is well before the invention of the internet and even the thought of online gambling. Even with this being the case, this law has been used many times over the years to make rulings against online gambling. The Wire Act of 1961 was initially used to work with other antiracketeering laws such as the Travel Act and others. The law was obviously not drawn up in regards to the online gambling industry but because of the way it was written it still is applicable in governing the industry. The first purpose of the Wire Act was to help the states and territories of the United States enforce their laws on gambling and bookmaking and to suppress the gambling in organized events. The law has one section that allows it to be used by law enforcement to apply to the newer industry of online gambling. "Whoever being engaged in the business of betting or wagering knowingly uses a wire communication facility for the transmission in interstate or foreign commerce of bets or wagers or information assisting in the placing of bets or wagers on any sporting event or contest, or for the transmission of a wire communication which entitles the recipient to receive money or credit as a result of bets or wagers, or for information assisting in the placing of bets or wagers, shall be fined under this title or imprisoned not more than two years, or both." In this section of the law when it says that anyone who places a wager or a bet using wire communications allows for any law enforcement agency on either the state or federal level to use this law against an online gambling site. However in 2011, there was a change to the law that changed everything. The legal opinion that was released by the Department of Justice in 2011 gives the states more authority in deciding how they wanted to handle the online gambling industry. The opinion decriminalized certain forms of gambling that in the past had been illegal. With this change the DOJ would no longer seek criminal charges against those who play online versions of casino games such as poker, slot games, bingo, and lottery options. Even with this change, online sports betting was not included and remained illegal. The change has not completely changed the world of online gambling. It doesn't change the fact that a company the provides online gambling options to restrict its players by state if the state they live in has not legalized online gambling then they cannot play. It also hasn't helped those states that have legalized online gambling to operate without issue. Some of the other laws regarding online gambling still create problems for those states that have legalized the industry. In recent years there has been a push to re-enact the original Wire Act of 1961. This new bill is called the Restoration of America's Wire Act and was introduced to Congress in 2014 by Senator Lindsey Graham and Jason Chaffetz. This bill is designed to restore the Wire Act to its original state where all forms of online gambling would be illegal. If RAWA was to pass and become law it would essentially bring to an end the entire industry of online gambling. Since it would reestablish that most forms of gambling would be illegal it would no longer matter if a state had legalized it or not. The bill does have some exceptions, but many of the most popular forms would no longer be available in the online gaming world. Another 1961 law that was passed by the US government with the intent to close the gaps for the gambling industry came in the form of the Interstate Transportation of Wagering Paraphernalia Act. This act made it illegal to transport any record, paraphernalia, ticket, certificate, and bill, slip token, paper, writing, or any other device used, to be used in book making, or wagering pools for sports betting. This law, much like the Federal Wire Act, was enacted way before the time of online betting but is still very much a part of the business. This law makes it illegal to basically send anything over the internet, through the mail, or any other means of transfer that can or will be used to make sports bets. All of the laws we've just gone over can be found in their entirety on the federal regulations web site. We've given you the summary of the laws with the intent to inform you of laws that always take precedent over state law. Regardless of how constitutional these laws may seem or not seem they're still currently in effect and must be obeyed unless you want to find yourself sitting in federal prison. The next law we want to talk about is the Unlawful Internet Gambling Act. This law is different from the Wire Act and many others because it doesn't target the gamblers playing the games but the companies that supply the games and companies that process the payments to and from the online gaming site. This law was able to pass both the house and the senate easily because it was attached to other laws that were widely supported. If this hadn't been the case this law might not have been able to make it into law. This law doesn't prohibit players from playing the games. The law was drafted with the intent to stop money laundering, fraud, and other financial crimes. This law prohibits online gambling companies from accepting payments from someone that violates federal or state laws. It regulates how payments are made for online gambling transactions. This law basically makes it illegal for a company to accept payment from banks or credit card companies. This causes issues for not just the online companies but for the players as well. When this law was signed into law it caused a mass exit from the US market of gambling sites and payment processors. This law made it nearly impossible for US players to find an online gambling site that would accept them and allow them to play. This is still an issue with most brands being offshore companies that won't accept US players. In the years since the passing of this law the market has stabilized and the use of prepaid accounts, prepaid credit cards, and some digital wallet companies have given US players the ability to start playing again. 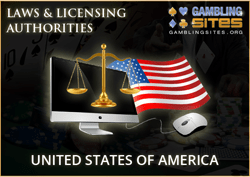 One good thing that has come out of this law being passed is that the sites that offer online gambling are safer and more reliable for the customers of the site as long as they are operated within the United States. You must remember that this law has no effect on offshore companies that accept US players so be careful what site you choose to play on. This laws basic purpose is to completely ban online sports betting. Also known as the Bradley Act, this law works with the Federal Wire Act to make it illegal for anyone in the United States to place bets on sporting events like football, basketball, and baseball via the internet, or any other wire transfer methods. Some sporting events however are legal to bet on through the internet. Sports like pari-mutuel horse racing and dog racing are some that are exempt from the law. When the law was first voted in the U.S. government included a grace period for states that had been allowing online sports betting to alter their sports betting so that it could continue without violating the law. This grace period was primarily for New Jersey, who in turn didn't take advantage of this opportunity and has since filed a law suit stating the law is inherently unconstitutional. Some states however do have sports lotteries which don't fall under the guidelines of the PASPA law and are still legal for online betting. Those states include Delaware, Montana, and Oregon. The law also doesn't prohibit US residents from participating in sports betting with an offshore online casino. Demand is growing to have this law repealed, but even if the law is repealed the use of online means to place bets on sporting events would still be considered illegal due to the Federal Wire Act. Repealing this bill would only make it legal for sports betting in land based casinos. This law was aimed at ending the involvement of organized crime in the gambling business. This law states that any gambling operation that is in violation of state or local law that has five or more people conducting its operation, and remains in continuous operation for 30 days or makes more than $2,000 in revenue in a days' time can be prosecuted. This law doesn't include the bettor as a person that can be found guilty under this law, however anyone who works for the gambling business itself can be. This means that anyone from the owner of the business down to the runners can fall under this laws prevue. This law was written with the intent to be extremely vague giving the government the ability to bend the rules to enforce the law as they see fit. The statement about continuous operation allows them to determine how regularly the so called illegal activities are taking place. It also gives them the ability to only have to prove the involvement of someone in the illegal operation and not that they knew the activity involved five or more people or that the five individuals were involved for the allotted 30 day time period. Each state in the United States has the right to pass and enforce its own laws. These laws don't take a higher level of legality than the Federal laws but most federal laws do defer to the state's laws to see if they've been violated before the federal law is enforced. Each state has the ability to prohibit its residents from engaging in any form of online gambling. Some states allow only certain types of online gambling while others have completely legalized the industry. We've gone through the states one by one to determine what the laws are and how they can affect your ability to place bets online. We provide this information for knowledge purposes only and don't intend for the information to be used for a legal purpose. We aren't lawyers so if you're having a problem, make sure to get further advice from a licensed lawyer. To determine if an act of gambling is a violation to the state laws there are certain factors used by states. They are the Dominant Factor Test and what classifies social gambling. Then states must also determine whether the violation falls under the law as a misdemeanor or a felony level crime and whether the crime meets requirements to be distinguished as a simple crime or an aggravated crime. The Dominant Factor Test is applied to an activity to determine if it violates state law. This test determines if a gambling activity is based on chance. If it's determined that chance outweighs actual skill, more than likely this violates the state's laws on gambling. Most states have determined that if a game has an element of skill that is required to successfully play a game then it doesn't violate the law. Not all states use this test, but as you read you can see which states do and which states don't. States also divide gambling up into different categories and usually have an allowance for social gambling. Determining what social gambling is can be tricky depending on the state. Generally social gambling is when all those involved in the gambling are on equal footing. Basically the people working the game can't benefit from the game more than a player can. We've also determined the levels of violations in each state so as you read you can see what states you can play in and what states you can't. States that have legalized online gambling know that to be successful in the industry that they must have a large pool of players. Since not all states have regulations on this type of gambling and the legal system can at times be rather grey when it comes to this industry states must be careful when accepting players from other states. Having a pact or other agreement with other states is a great way to legally offer online gambling to residents from other states. This is becoming a new way for states to work together to embrace this large industry in the United States. In recent years more states have started working on legislation to regulate the use of online casinos and we can only hope that if they decide to legalize it then they're willing to work together to make our online gambling industry as successful as that of other countries. As we've shown you, online gambling is part of a vast grey area in most states which causes online casinos to become leery of allowing players from the United States to play at their sites. Over the years the ability for Americans to play at online casinos that originate outside the US has grown but there are still a large number that don't want the hassle. We decided to include a list of online casinos that accept US players so you don't have to look any further than right here to find out what sites readily accept players from states that allow online gambling. With this page we intended to help you as an online player to be able to know for sure if you're playing legally or if you're taking a chance of being charged with a crime in your state. We included all of the 50 states so that you can easily determine which states are online gambling friendly states and which ones frown upon the industry. You can find everything about the federal laws that have an effect on how the industry is run and what types of gambling is permitted by the federal government. Always remember that we aren't lawyers so if you think or have any reason to believe you might be in violation of any laws by joining an online gambling casino make sure that you contact a lawyer before you join. This way you get expert legal advice that can tell you for sure if it's ok to join or not. We hope you've found everything you need on this page including your next casino to try out. Some of those in our list of casinos are top rated and have amazing sites to play on so do your research and find one that's right for you.